No one has ever intentionally undertaken to obtain shaped Si crystal wafers by plastic deformation. If plastically deformed Si crystals could be freely obtained, new applications based on various creative concepts could be actively developed in a wide range of fields. We report on the successful plastic deformation of Si crystal wafers for the preparation of wafers with various shapes. One application of shaped wafers is as well-shaped concave Si crystal lenses or mirrors. 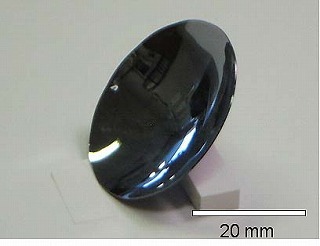 The lattice plane of such a crystal lens has a curvature exactly along the surface. A new solar cell system is proposed and demonstrated with the concave Si crystal mirror used as both a solar cell and a focused mirror. This system can make use of the reflected photons from solar cells. The work has been done in collaboration with Kyoto-U, and was published in Web site of Nature Materials on Dec. 20, and introduced by such press sources as Yomiuri, Kyodo-Tsushin, Kahoku-Shimpo, Nikkan-Kogyo, and DIE WELT.